Ah, yes…junky treats. We all know them. They’re the ones with Funfetti cake mix, chopped up candy bars, and marshmallows. Those items have a list of ingredients a mile long, and go into recipes that claim to have only 3 (cake mix counts as “1” ingredient). We generally avoid those recipes, because frequently they aren’t actually recipes! Yet they often taste yummy. It’s hard to admit that, but it is true! So sometimes, you need a junky treat (even if it doesn’t have 3 ingredients), and the afternoon after our AP Chemistry was one of those times. We don’t want to talk about the exam here (not that we could even if we wanted to; integrity, people!) because obviously the brownies are more interesting. We took our favorite brownie base and stirred in chopped up Oreos and Cookies ‘n’ Creme Hershey’s Kisses (Not liking the spelling here. ‘n’? Creme? Hershey’s is not French). 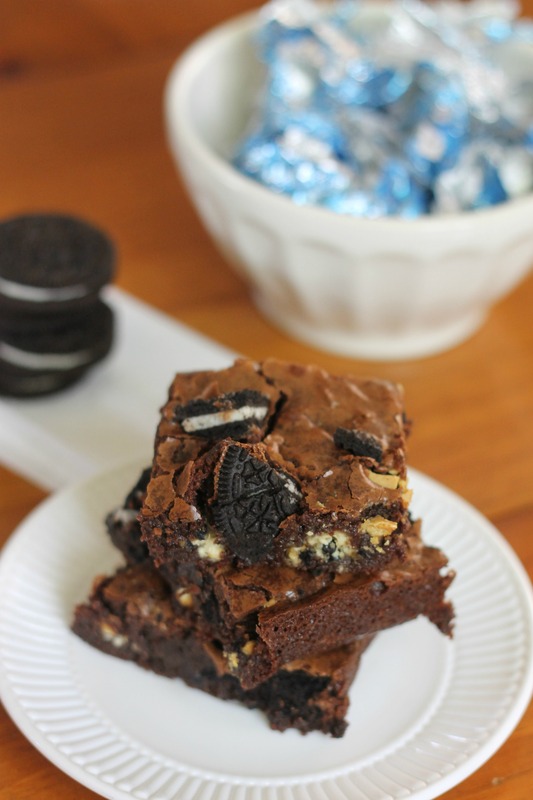 So basically, these became one of the best trays of brownies ever! 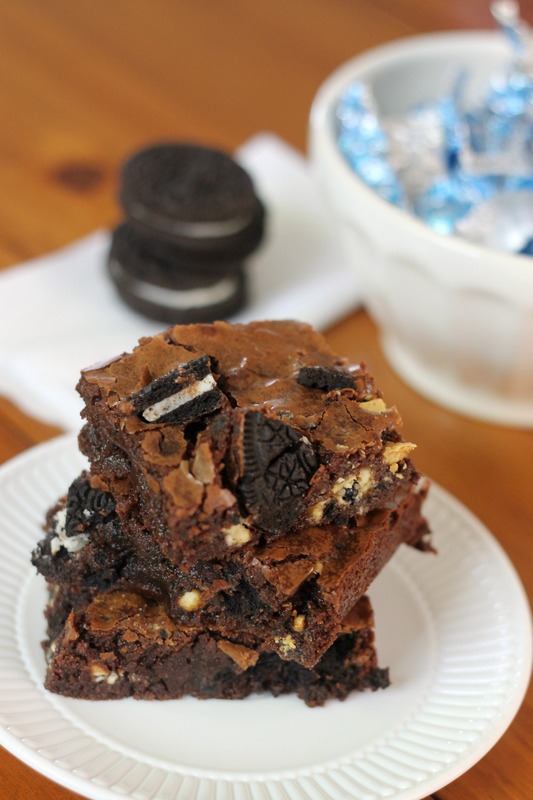 Mainly because Oreos are awesome, but also because a brownie is much more enjoyable to eat after a long day of making your brain skinny (from exercising it by taking a test, of course. Thanks Emily!). Although a run after these wouldn’t hurt either :)! Preheat oven to 350 degrees. Line a 9×13 inch pan with foil and grease it. Chop up the Oreos into quarters and the Kisses in half. Melt butter and chocolate together in a medium-sized pot. Stir in sugar. Blend in eggs and vanilla. Add flour and mix well. Gently stir in the Oreos and Kisses. Pour into prepared pan. Bake 30-35 minutes or until a toothpick inserted into the center comes out with fudgy crumbs (don’t overbake!). Allow to cool, and then cut brownies and serve. Enjoy! Milk is good with these, by the way!